Nordstrom: Get ready to swoon, until 9/15 Nordstrom has 40% off a huge selection of shoes. Fierce pointed flats , pewter pumps and cut out booties are all on my radar for fall! Tory Burch : Pardon my slang but this sale is cray crayyyy. Take 20% off purchases of $300, 25% off of $500, and 30% off of $750 with the code: LABORDAY. Hurry because it ends 9/2 and things are already selling out. I have my heart set on this, this and these. Forward by Elyse Walker: As I mentioned a couple days ago, designer label lovers need look no further. Givenchy, Alexander Wang , Iro. Enough said. Shopbop: As usual, Shopbop never disappoints. For my upcoming trip to Mexico I'm going to have to get this coverup and for those of you that don't have an army jacket yet, this is a must! Omg those Vogue dogs are the cutest! 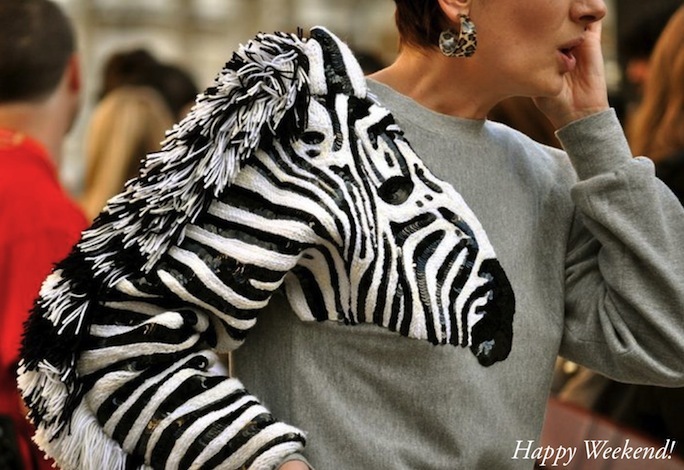 That zebra sweater is hilarious! I can't wait to go shopping tomorrow! Jeans and a Teacup - Wine Jewelry Giveaway! oh em gee! that zebra sweatshirt... dying!!!!! !